operating modes: such as SW Patching, OS Update and Upgrade, Penetration Test, BC / DR: all periodic and repetitive activities. Last but not least: documenting, documenting and finally documenting everything. The goal of this work is to define the process to obtain a resilient and secure basic configuration for operating systems (Unix). The indications provided are independent of the particular installed version of the Operating System, and are considered minimum measures the implementation of which is necessary to contain, within acceptable limits, the risk of compromises of confidentiality, integrity, and availability of the Information Resources. These instructions constitute the basic requirements that must be met and that, by virtue of the specific characteristics of the operating context to which they apply, can be increased in cases where higher levels of protection are required and must necessarily be followed also by the Platform Providers ITC. 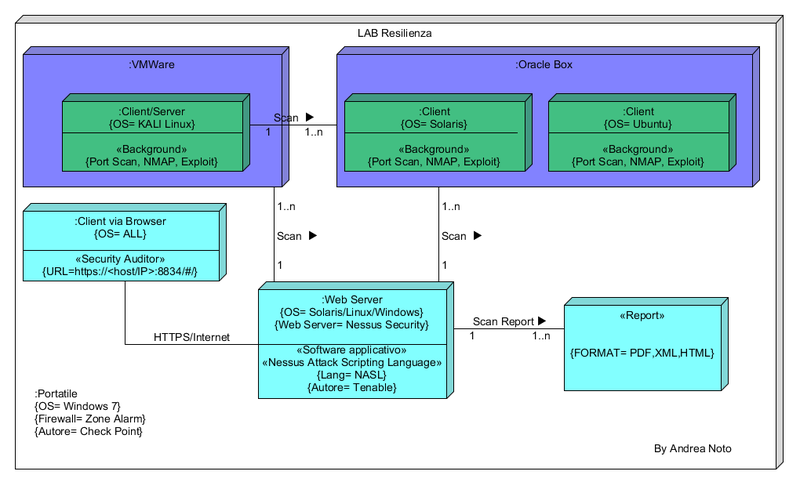 The following described technical instructions have been applied to a Solaris system, scanned by Nessus (free tools for up to 16 nodes), installed on Windows 7, from which to perform the penetration tests on the Solaris virtual node, installed using Oracle VM VirtualBox. Below are the instructions to follow for the proper configuration and management of the Unix systems. The installation and initial configuration of any Operating System are operations of particular importance, since their execution may have implications on the security features of the same. the type of service: development, test (or testing), production. Any variation in the configuration of a system must be previously tested in development environments (when applicable) and testing, prior to its application in production environments. only kernels provided by the manufacturer must be used. conservation of monitor data (eg system logs and accountability logs) for the fixed period of time and in accordance with current regulations on personal data protection. The server connected to the internet in order to easily download the available updates directly from and on the server concerned. Make sure there are no defeated CPU / ram on the server, or failed drives. It is necessary to check the consistency of the FILESET and also the space available to perform the update, which can be analyzed using the pkgchk on Sun10, on 11 pkg in the dry run, and df commands for all. The compatibility of the kernel level must always be verified with the Operating System FIX, which must be compatible with the installed Firmware. If the server is configured with mirroring, you have to physically disconnect a system HD that is part of the mirroring pool or disable one, because, in the event of a failure of the system patches update procedure, you have the possibility to restart the server, reconnecting the HD preserved precautionary before the update intervention. If server belongs to a cluster, you have to disable the cluster and unhook it from the balancer. To guarantee service continuity, we need to design the dual or clustered architecture of the systems providing the service itself, the mirrored HDs and the replicated DBs, one in R / W, the other in Read only to balance the load of work, all in the event of a disaster, in order to perform a fast and reliable recovery. In the specific case, the systems were cloned, an Oracle Box function. To avoid potential vulnerabilities on Unix servers, you need to disable those services that allow the transmission of data in clear, such as the Rexecd daemon, which allows remote commands to be executed without encryption, as well as to delete vulnerable software or correct them with the appropriate patches. It is also mandatory to use software for encrypting sensitive data in the databases, so for example when data is exported in Ascii format are not intelligible. Another topic that falls into the vulnerabilities is that on passwords, not only must comply with the security requirements, ie length, at least one special character, a capital letter, etc. but it is absolutely forbidden to communicate them by email or leave them pinned on an unattended sheet on the desk, since 60% of cyber attacks occur inside own walls of work. According to the “NIST directives”, passwords must be longer than 14 char if multiple authentication tools such as tokens, otps, smartcards, and biometers are not used and must be changed every 45/60 days. The login as an administrator must be from a client not connected to the internet, or from which you do not “surf,” you can not read E-mail and you can not edit office documents. Therefore direct access to Unix servers with the root user must be blocked. However, we must pay attention to this stratagem, that is, if we use a transient user from which to make the user root switch, this user must not have its home directory under /home, because if by mistake a third user uploads a huge file that saturates the file system /home, then no user who is not superuser can log in, as long as space is not freed up under the same /home but from the console itself. Then minimum precaution, the Unix users present in the servers of an environment (eg Testing), must not have the same password to access the Production and/or Development servers. You need to configure the system to register a log entry and warnings when a Unix account is added or removed from the domain administrators group, or when a new administrator account is created. Also, report any failed login attempts from a user administrator. The root user access must be enabled on explicit request specifying the motivation and timing of use. May 2017 Hall of Fame! !